Obtains information and interpret information in terms of the patient’s needs. Minimum Qualifications: A. Graduate of an accredited or NLN-approved RN program. B. PALS or NRP (current or obtained within 90 days of employment) in required specialty. C. BLS and ACLS (current on hire). D. CPI (current or obtained within 90 days of employment) in required specialty. E. Current state nursing license. F. Must successfully pass any pre-employment assessment(s) required by the facility. G. Prefer one year full time or three years part time experience in acute care setting. Welcome to Coast Plaza Hospital – where providing high quality, compassionate medical services is our priority. We are a 117 acute bed hospital providing high quality medical services to the city of Norwalk and the surrounding areas of Southeast Los Angeles County. We are accredited by the Joint Commission and are licensed providers for Medicare and Medi-Cal programs, along with many HMO’s, PPO’s and managed care organizations. We offer a full range of diagnostic and therapeutic services designed to meet the needs of our patients. We have been serving our community for over 55 years providing a wide range of services including adult and pediatric Emergency Department services 24 hours a day. In addition to its Emergency Department, Coast Plaza provides complete intensive care, critical care and progressive care services, including state-of-the-art healthcare tools such as radiological diagnostic machinery (CT Scan, Ultrasound Services and an open MRI), laboratory services and a hospital-wide patient monitoring telemetry system. 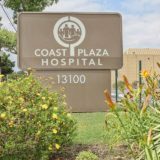 Coast Plaza also utilizes an advanced array of surgical equipment for both general and specialty services, and has incorporated a modern nursing communication system designed to make each patient’s stay as quiet and pleasant as possible. Our Hospital Leadership is committed to providing affordable, high-quality healthcare services to our community with consistency and compassion.